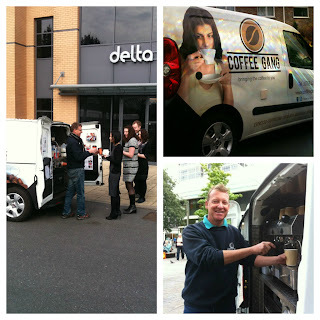 Launched in September 2011, we are Swindon's only mobile gourmet coffee service. FANCY A COFFEE? We deliver espresso-based drinks, Chai Latte, Builders Tea, Earl Grey, decaffeinated Tea and Coffee, Hot Chocolate, plus homemade cake, cookies and filled rolls to workplaces throughout Swindon. MORNINGS: Swindon Borough Council, Assured Car Sales, Cross Street garage, Nokia, Nationwide, Travelport, Structa, Pure Offices, Delta Business Park, Swindon Audi, Vygon, Eco Signs, Windmill Hill Business Park, Lydiard Academy, Rombourne Serviced Offices and many more. At weekends we supply the same service to sports tournaments, fetes, community, charity and other small events.